Al-Qaradawi previously issued a fatwa stating that Muslims who are killed fighting U.S. soldiers in Iraq are martyrs. "Those killed fighting the American forces are martyrs given their good intentions since they consider these invading troops an enemy within their territories but without their will," he told Al-Quds Press Agency. That was not the preacher's only call for violence. In a statement that aired on Al Jazeera TV in 2009, al-Qaradawi said the Holocaust was a "punishment" for Jews and expressed hope for Muslims to carry out another genocidal campaign in the future. "Throughout history, Allah has imposed upon the Jews people who would punish them for their corruption," al-Qaradawi said. "The last punishment was carried out by Hitler. By means of all the things he did to them—even though they exaggerated this issue—he managed to put them in their place. This was divine punishment for them. Allah willing, the next time will be at the hand of the believers." Al-Thani's apparent embrace of al-Qaradawi is particularly significant given the recent scrutiny Qatar has undergone for financing Islamist terrorist operations. President Donald Trump last year castigated Qatar as a "funder of terrorism" and backed its rival Middle Eastern states, led by Saudi Arabia, in a regional feud. However, al-Thani and Trump had a warm meeting in Washington, D.C. in April. Both men vowed to stop terrorist funding and work as allies. Trump called al-Thani a "great friend." 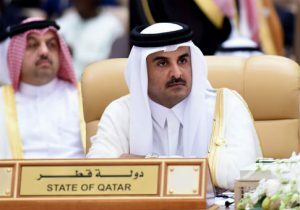 Experts have long noted the Qatari government's ties to terrorist financing and have accused Doha of spreading anti-American propaganda by funding Al Jazeera. The Washington Free Beacon disclosed earlier this year that the media network carried out a secret, months-long spy operation on American Jews and supporters of Israel.